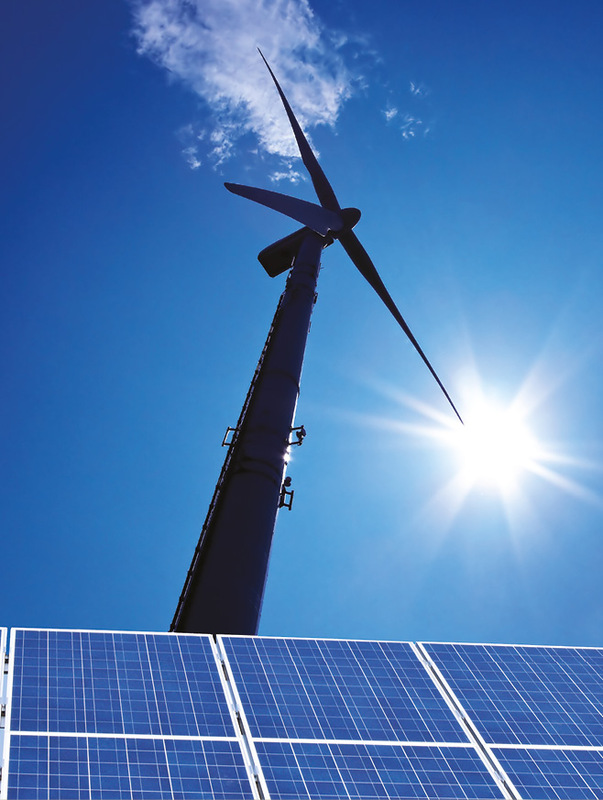 Richard Halleron looks at the role solar energy could play in Ireland’s future energy mix. Ireland’s recently published National Mitigation Plan, developed by four government departments, confirms that the sharp decline at a global level in the cost of solar photovoltaic (PV) technology has resulted in significant interest in this renewable technology across Europe and in Ireland. It also confirms that technology costs are projected to fall further. However, the use of this technology in Ireland is less efficient than, for example, areas of southern Europe where solar penetration is stronger. That said, it is generally recognised that the deployment of solar PV in Ireland has the potential to contribute to the country’s renewable energy targets. Solar PV can be deployed in roof-mounted or ground-mounted installations, and in this way it can empower Irish citizens and communities to take control of the production and consumption of energy. 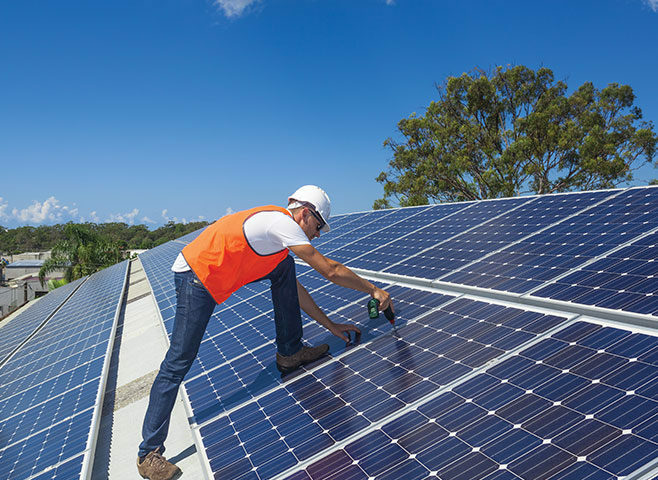 Solar PV is one of a range of technologies under consideration by the Department of Communications, Climate Action and Environment (DCCAE) as part of the new Renewable Electricity Support Scheme, which is currently under development. At present, financial support is available for solar thermal heating technology through the provision of grants offered by the SEAI. Large industry and Small and Medium Size Enterprises (SMEs) can avail of these grants, while households can also avail of grant support for investment in solar thermal under the Better Energy Homes Scheme. There were over 500 applications submitted to ESB Networks for connection of solar farms in the Republic of Ireland, totalling over 4,000MW between May 2015 and December 2016. It is estimated that 1500MW is achievable by 2022, which equates to 5 per cent of Ireland’s electricity demand. Over 90 applications have now been submitted to local authorities for planning consents for solar farms. A number have now achieved full grant of planning. Typical applications are for 20-30 acre farms. Key aspects of the planning applications include landscape and visual assessments, which have proven to be minor, as solar farms typically will be no taller than 3 metres and can be well screened using existing hedge rows. Other key elements of the applications are glint and glare assessments which detail the potential impact on nearby receptors along with ecology and archaeological assessments. An important consideration in the selection of sites is the proximity to the local substation, as current Irish requirements necessitate the direct connection to the local grid network. This is unlike the UK and Germany, where access can be provided by direct connection to an overhead line that crosses a site. The rapid deployment of solar PV throughout the world in the last few years can be attributed to many factors, but two of the main factors include a drop in module price from US$70/watt in 1970 to US$0.45/watt today and also government subsidies. Advocates of solar energy believe that the technology will have minimal impact on the environment while, at the same time, delivering maximum benefits to Irish consumers and the economy as a whole. This comes with the caveat that, with the correct support, solar has the potential to become one of the most economically viable, renewable energy sources in the country. According to the Irish Solar Energy Association (ISEA), solar has been overlooked in Ireland with the focus placed on other renewable energy sources, particularly wind. However, as many other Northern European countries have recognised, solar is an important component of the renewable energy mix and may provide a significant opportunity for Ireland to accelerate the rollout of renewable energy at an affordable cost, while creating new employment opportunities. ISEA also points out that the benefits of solar extend beyond the provision of clean energy and electricity. In the context of Ireland’s renewable energy mix, solar PV can be viewed as a complementary source of energy to wind, and other renewable technologies. Thus, according to the technology’s proponents, it contributes to the creation of a diverse, resilient and secure electricity supply. This, in turn, could create additional benefits for Ireland such as: enabling the country to achieve its EU targets for climate and energy in 2020, and the EU 2030 Climate and Energy Framework, creating jobs, generating income for farmers, and supporting economic and social growth. Further innovation within the solar sector is also envisaged. This stems from decreasing costs of technology and increasing interest. There is also growing evidence to confirm that the applications of solar are constantly expanding. These range from solar panels in electric vehicles, to solar walls on buildings. It is also envisaged that solar PV will continue to add value to the economic, environmental and social policy objectives of the Irish Government. ISEA was founded in May 2013. The organisation is committed to bringing attention to the value of solar energy’s contribution to Ireland’s economic and environmental future. ISEA members believe that the deployment of solar technology in Ireland will lead to the creation of more than 7,300 jobs across the country and will help save Ireland from EU fines in excess of some €300 million per annum. ISEA has estimated that an annual subsidy of €30 million will be required to make solar competitive in Ireland. This estimate reflects the fact that Ireland is as geographically well placed as Germany, when it comes to utilising solar energy. However, there is also a recognition that, as is the case with other forms of renewable energy, developing efficient storage systems for solar will be critical moving the technology forward. 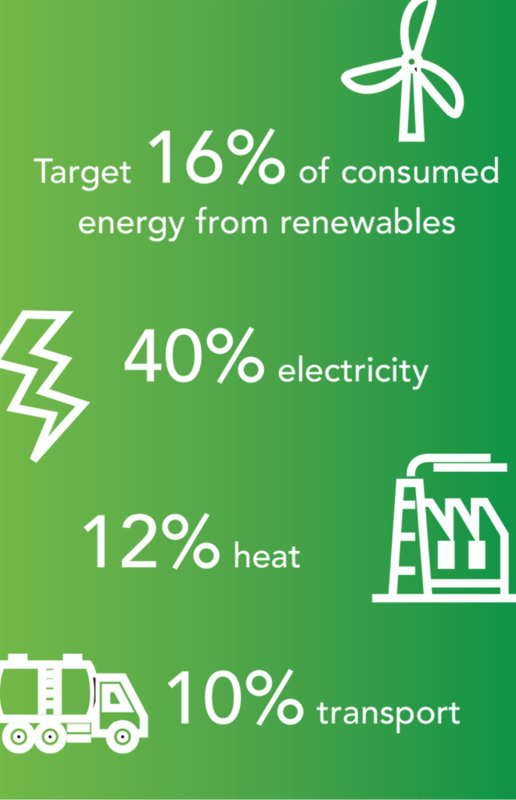 Under the 2009 Renewable Energy Directive, Ireland is committed to produce at least 16 per cent of all energy consumed from renewable sources by 2020. This will be met by 40 per cent from renewable electricity, 12 per cent from renewable heat and 10 per cent from the renewable transport sector. Minister for Communications, Climate Action and Environment Denis Naughten is fully aware of the significant volumes of solar energy projects proposed across Ireland. He also understands that the total amount seeking authorisations under spatial planning exceeds Ireland’s usual winter level of demand. The minister has responded to stakeholder pressure, requesting government support, enabling these solar developments to proceed. While acknowledging the solar industry’s own analysis which indicates that the costs of solar photovoltaic technology fell by 80 per cent from 2008 to 2013, he points to the need for more time so as to fully confirm if this rapid decrease is indicative of a deeper, underlying trend. If this is the latter, and the technology costs continue to fall, then it is vitally important for a support tariff to be offered for solar that is competitive and minimises the cost to consumers. Fundamentally, Naughten sees a place for solar in the energy mix put in place for Ireland. However, the government will not accept a situation where a new support scheme leads to an excessive increase in people’s electricity bills through a higher Public Service Obligation levy. The principle to be espoused is that of ensuring that the scale and pace of development are appropriate to the resource available and to the target physical and social environment where it will be constructed. Naughten has confirmed that in-depth economic analysis is currently underway to inform the actual cost of a new renewables’ scheme and, while no decision has been taken on the precise renewable technologies to be supported, the cost and technical viability of several technologies including solar are being examined as part of this assessment process. The findings from this analysis will also inform the design of the tariff to be introduced and help ensure that appropriate budget management mechanisms are built into any future solar support scheme to ensure value for money for the consumer. Meanwhile, the Irish Farmers’ Association is calling for the fast track introduction of Ireland’s Renewable Heat Incentive (RHI) so as to allow for its implementation in the first quarter of 2018. Ireland’s largest farming organisation believes it is it is positive that Denis Naughten has given confirmation that the RHI will be exchequer-funded, and that technologies, including solar thermal will be eligible for support under the scheme. The IFA has also indicated that the proposed 15 year contracts and tiered payment rates, based on metered heat produced, should give the certainty to those who choose to participate. The IFA is calling for a percentage of the RHI budget to be ring-fenced for agricultural and community based projects. In a similar vein, Irish Cattle and Sheep Farmers’ Association (ICSA) president Patrick Kent has welcomed the recent Friends of the Earth report, which strongly recommends that Irish state policy should support roof-top solar energy. The publication proposes a combined tariff for generation and export to the grid, which essentially means that adopters of the technology would sell excess energy to the grid. According to Kent, it makes sense that government should incentivise farmers, who have significant roof space over farm sheds to invest in solar energy. However, getting access to the grid must be a priority, as is setting a fair REFIT tariff. The ICSA president also believes that the ongoing delay in announcing the RHI and the ongoing uncertainty around REFIT tariffs point to the fact that Government policy on renewables is unfit for purpose. The versatility of solar is recognised as a key driver for its more widespread adaptation moving forward. Critically, it is a renewable energy technology that can be integrated into the built environment on rooftops and walls, as well as being deployed as large projects in rural Ireland. As a consequence, organisations such as the ISEA believe that solar PV is both an interim mitigation measure, while the Government determines how to diverse Ireland’s energy portfolio, and a long term adaptation measure as part of Ireland’s resilient and diverse renewable energy supply. The Irish Solar Energy Association (ISEA) was founded in May 2013. ISEA is committed to bringing attention to the value of solar energy’s contribution to Ireland’s economic and environmental future. ISEA will contribute to the development of viable renewable energy policies that support solar in Ireland including lobbying activities, conferences, and other forums that bring key stakeholders together to shape policy. Solar is a rapidly developing technology that simultaneously combines minimal impact on the environment with maximum benefit. Solar is forecast to become the most economically viable renewable energy source globally in the coming years. ISEA recognises the potential for solar in Ireland and will work tirelessly with our members to promote solar, not only as a means for meeting Ireland’s renewable energy and electricity targets, but as a long-term sustainable and clean option with numerous benefits for Ireland economically, socially and environmentally.